Difference between revisions of "Venceslo"
This page is for the city of Venceslo. Did you mean: Venceslo Village (building)? This city has recently been promoted to the Premier rank! Be sure to check it out soon. Congratulations! Venceslo (pronounced Ven-Sez-Low) is a [Premier]-ranked city located in the shallow southwest gamma region, in Ward 5. It is founded, owned, and operated by time2makemymove, who prides himself on having built every single building in the city except one, noted in the building list. It is home to the famous Venceslo Village, Time2 HQ, the campus of Venceslo University, and possibly the three most obvious aspects of the city, SkyNation Arena, BearLodge Park, and Venceslo-Fifth Ward Airport. It is divided up into multiple districts. 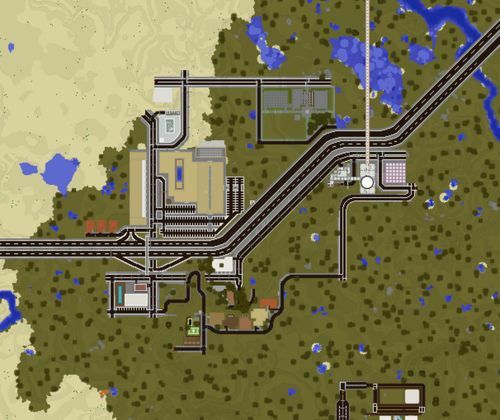 It has a fully complete minecart subway system (the VMet), and the city's roads are connected to the , , and . The area of Venceslo was first discovered to be unclaimed on May 27, 2017. Seizing the opportunity, time2makemymove took the area and immediately began building a franchise of his from his earlier endeavors of Minecraft. This franchise was named CraftHouse, and it was built to the immediate east of the ZS20 station and was never fully completed. It was then demolished and replaced by Time2 HQ, inside of which another version of CraftHouse was built - which has ALSO not been completed as of this writing. A few days later, time2makemymove learned that a multicomplex concept had never been built on the server before. Using this knowledge and a bit of inspiration from Los Angeles' LA Live, he began building what would later be known as Venceslo Village, named after a player he created on NBA 2k13, "Venceslo Blackwood." This multicomplex was planned to include a mall, a hotel tower, a conference hall, a franchise headquarters, an amphitheater, and a monorail. All of this came to fruition by early July (except for the monorail, which was shelved until 5 months afterward), and the Village opened fully on June 22, 2017. However, the Village needed roads to get to. As such, time2makemymove began building roads in and around the multicomplex. In doing so, he ended up creating the framework to create the town of Venceslo as a whole. The first building in Venceslo that wasn't part of the Village was the Venceslo Town Hall, located on a sand hill north of the Village. From there, a sprawling town was born, and has continued to expand since then. On July 3, 2017, the town of Venceslo received the Councillor rank, being endorsed by Frumple and jphgolf4321. It received Mayor on August 1, 2017, being endorsed by godzilltrain and lalaboy. 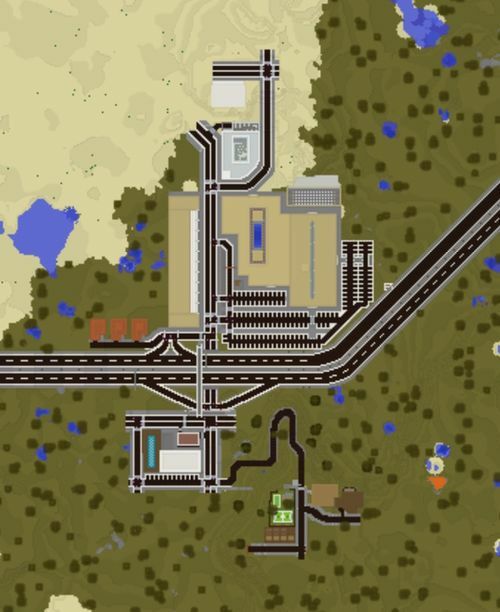 On August 3rd, 2017, the VMet, Venceslo's local subway system, was founded, and its first station was complete. Its goal was to provide a quick and easily accessible way to access all other areas of the town. However, it took time2makemymove until the 30th of that month to build the second station and open it to the public. Since then, the system has been rapidly increasing in both size and efficiency, launching a new version of the stations (VMetV2) into action for the newest stations. As of October 2017, four stations are open. On August 5th, 2017, Venceslo University was founded, located in the northeast corner of the town, northwest of the MRT Station. This marked the beginning of the town's true quest to receive the rank of Senator. The University was slowly built up over the course of the next two months, using a constant style of vintage University decor, with mostly bricks and stone for the exteriors. A connection to the VMet system was completed in late September, and it is currently the only VMet station to not use the VMet's traditional design - instead matching the architectural style of the rest of the university. A hospital, run by the university, was planned to be built immediately west of it. That plot where the hospital was planned to be ended up being the location of the UAV terminal. On September 28, 2017, time2makemymove launched an new plan to reorganize the Venceslo Village area to make room for more development west of Venceslo Parkway. This project became known as the Venceslo Midtown Revitalization Project. Overseen by VenDAG (Venceslo District Association of Governments), this project has a number of goals. The main goal is to build a stadium west of Venceslo Village, and some housing west of the stadium. A stadium on the west side of Venceslo had been in the conceptual stages for a while, but eventually it was agreed upon that in order for a stadium to fit into the design of the area, some buildings would have to be moved or demolished. Every building north of the A51 and west of Venceslo Parkway were moved from its original location or just demolished outright. The three loft houses on Blackwood Road were moved across the highway to Avenida Ferrocaril in South Venceslo. This was all done using the same two cranes for each house. Italiaso, a restaurant franchise located on the corner of Blackwood Road and Venceslo Parkway, was ripped apart from the Venceslo Village Convention Center, and was moved using two cranes to its current location, east of The Shops at Venceslo Village. And finally, the hardest project by far, was moving the Convention Center itself. Using six cranes, the Convention Center was split up into eight fragments, carried up Morton Hill Road by a number of tractor trailers, and placed on top of the southwest corner of Morton Hill. A retaining wall was installed after the placement, and then the roof of the Blox Bells Amphitheatre (which had been impacted after the relocation was complete) was redesigned to be more structurally sound (as the convention center has part of its frame resting on top of the Amphitheatre). Now that all of the relocations are completed, the second half of the VMRP plan is to actually build the Stadium. The stadium, then named Icicle Holdings Stadium (now renamed SkyNation Arena after its reconstruction), was named after CyAmethyst won the naming rights, and was completed in time for the batch date. At the end of October 2017, the results of City Rank Promotion Batch #18 were announced. Venceslo, along with four other towns, was promoted to [Senator]. For Venceslo, the margin was 6 yes to 0 no. On the same date as Venceslo's Senator promotion, plans for Venceslo's Airfield were announced. 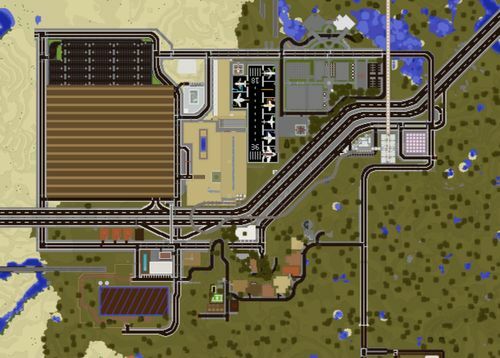 This airfield was completed and officially opened on November 11, 2017, located on top of the Venceslo Warptrain Terminal (whose entryway was subsequently moved somewhere else, before being abandoned altogether in favor of the new Midtown Station). UAV was owned and operated by Venceslo University, and as such was dubbed Venceslo University Airfield. UAV, as it is commonly referred to, opened in conjunction with Icicle Holdings Stadium, the Venceslo Village Expansion, and the Venceslo Monorail, during the Venceslo Senator Opening Party. Venceslo recieved Governor rank in Batch #21 by a margin of 7-1. 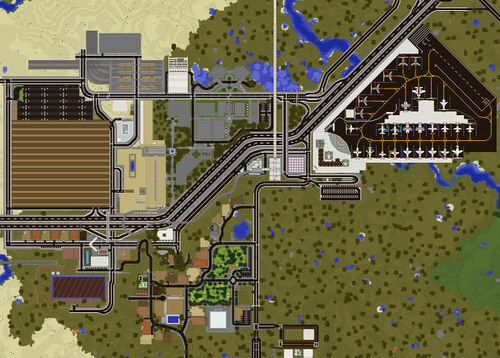 As one might expect, a large airport for Venceslo was immediately built. Dubbed Venceslo-Fifth Ward International Airport, or better known as VFW, it was opened in February 2018. In conjunction with this new large airport, UAV was decommissioned on February 23, 2018, and was demolished to make way for UAV PARK and two new buildings for Venceslo University. One of these buildings ended up being a hospital (Venceslo Central Hospital) - finishing off the master plan for the university that had begun many months prior. 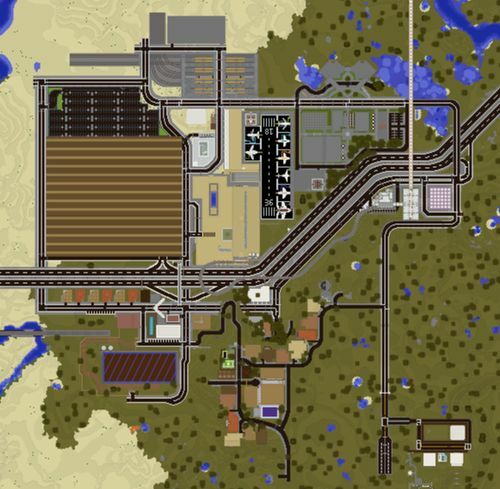 Construction on more houses in Upper Venceslo, the highway, Venceslo Gardens, and the reorganization of VMet stations on the eastern side all began in February 2018, and were all completed by late April 2018. On June 18, 2018, BLOCKLAND VENCESLO was opened, a small amusement park located in South Venceslo, on the old plot of South Venceslo Farms (the farms were moved farther south to make way for the park. On June 28, 2018, Venceslo left the United Cities, as time2makemymove (and the entire United Cities tbh) accomplished nothing during his time as a member. On July 22, 2018, Venceslo applied for Premier and was denied, with most admods citing "not enough builds." After lots of work preparing for the August GSM, including many new buildings in northwest Venceslo and southeast Venceslo, the city was denied again. 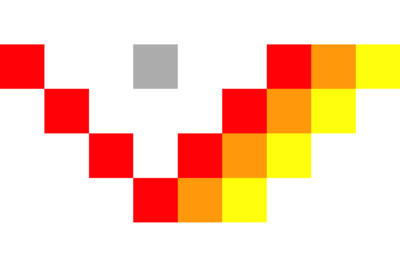 Time2makemymove has come to terms with this: therefore, the city will be staying at Governor rank for the foreseeable future, citing time2's happiness with the city as it stands, and with life stuff getting in the way of time2 being able to keep working on it. A few months later, in late November 2018, time2makemymove embarked on a huge redevelopment project in the North Venceslo Midtown area, citing the wish to make the downtown area more dense and interesting. To start with, Icicle Holdings Stadium was gutted and rebuilt to be an exterior stadium, and its' parking lot was moved underground. The stadium was renamed SkyNation Arena. The Jackalope Fireworks Warehouse was also moved from its old location north of Midtown Station to west of the arena. Many new building plots have been opened up, and are currently being filled in as of this writing. This project, called Venceslo North Redevelopment Initiative (VNRI), is projected to be completed in January 2019. Venceslo was sent once again to the GSM, this time in February 2019, for a Premier application and was once again denied. However, this time the feedback reaction was mixed: 5 staff were for a promotion, and 5 were against. The biggest obstacle remaining in Venceslo, time2 deciphered, was a lack of large builds. The build quality and count was there, but the builds were very small, a staple of the Venceslo style but not necessarily conducive to making a city feel epic. Over the next two months, time2makemymove embarked on three new large projects to finally get the city over that large hump. These projects were the Venceslo Zoo, Mariachi Ridge Farms, and BearLodge Park. All of these were completed just in time for the April 2019 GSM. On April 14, 2019, Venceslo applied for Premier and was accepted by a margin of 8-0, finally getting Venceslo to the highest possible rank a city can attain on the server, something that mayor time2makemymove admitted he "never thought was possible" when he first joined nearly two years prior - starting from some random mall in the middle of nowhere, sprouting quickly into a prosperous town, and then slowly developing into a cultural icon of the server with numerous well-known attractions and events held within. Time2's acceptance speech at the April 2019 GSM can be read here. Time2makemymove has alluded to marking this city as "complete" and moving on to other projects, however more expansion might be in the works this coming summer. Listed in chronological order: Higher on the list was built earlier. North Venceslo is the entirety of the area of Venceslo that is north of the A51. This area is most notable for having Venceslo Village, the Venceslo Art House, Venceslo Town Hall, and Venceslo University - as well as being the site for Icicle Holdings Stadium and the decommissioned UAV Airport. It used to have three houses built on Blackwood Road, but these houses were moved to South Venceslo as part of the VMRP. There are plans for a large stadium and/or governmental offices to be located west of the Town Hall and the Convention Center. Both Venceslo University and VH Hospital are located on University Boulevard. 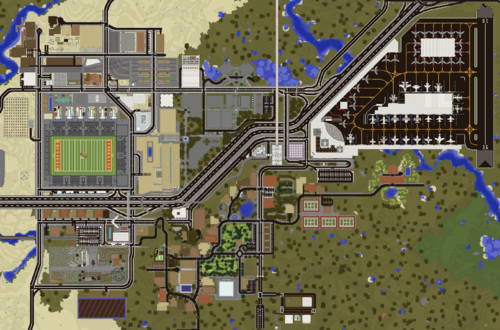 More recently, Venceslo Midtown Station, FliHigh Center, Jackalope Fireworks Warehouse, Venceslo North Library, and QUARTZBank Tower have all been built in the area. 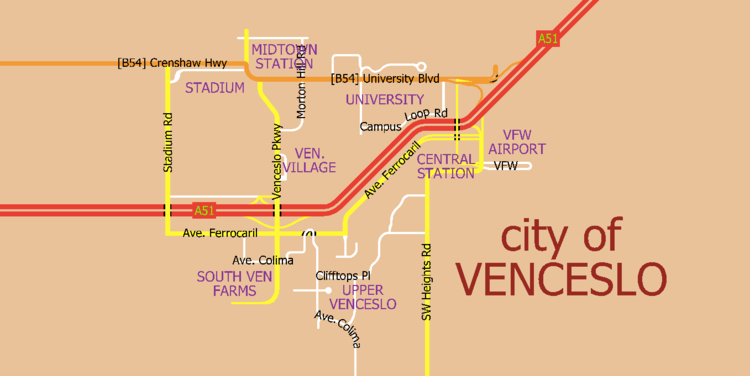 North Venceslo's main thoroughfares are Venceslo Parkway and University Boulevard, while Crenshaw Highway exits the region on both the east and west sides. South Venceslo is the second district that was created in Venceslo. Its area encompasses all of Venceslo that is south of the A51 and not situated on the Mountain. It was planned to be the the location of the majority of commercial buildings, but that plan has fallen out in favor of farmland and large housing. It is the location of Venceslo's only gas station. South Venceslo also includes the area known as "Stationtown," which houses Venceslo Central Station (the main station of the STC in Venceslo, the MRT ZS20 Station, the VMet Stationtown Station, and buses), as well as Time2 HQ, which is situated next to the station. 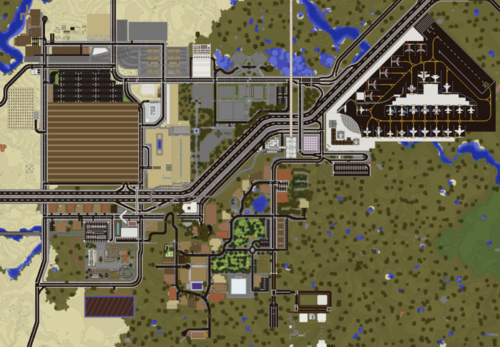 East of Time2 HQ is Venceslo's airport, which is the largest airport in the A51 region. South Venceslo's two main thoroughfares are Avenida Ferrocaril and Venceslo Parkway. South Venceslo also encompasses the community of Shadowbrook, a small area located in a hidden valley, where a couple houses and franchises are located - as well as Shadowbrook Casino, Venceslo's only gambling house. The third and final region of Venceslo, Upper Venceslo encompasses all buildings on the mountain that overlooks South Venceslo. It is southeast of the A51's interchange with Venceslo Parkway. This area is predominantly a residential district, with completed builds including Venceslo South Library, a small community park, 21 houses, and a church. Venceslo's only grade school is also located in Upper Venceslo. Venceslo Gliderport, the first completed gliderport of its kind, was built and opened on September 12, located at the edge of a cliff for east elytra takeoff (yes, Frumple approved this both before and after it was built). Venceslo Gardens is located in Upper Venceslo as well, a large park containing an 18-hole mini golf course, archery, and an outdoor spleef arena. Upper's main thoroughfares are Avenida Colima, Clifftops Place, and Southwest Heights Road (the latter of which connects to the neighboring town of Downsview). Buildings in Upper Venceslo are required to have an exterior of predominantly wood-based blocks (certain exceptions have been granted under rare and extreme circumstances, however). 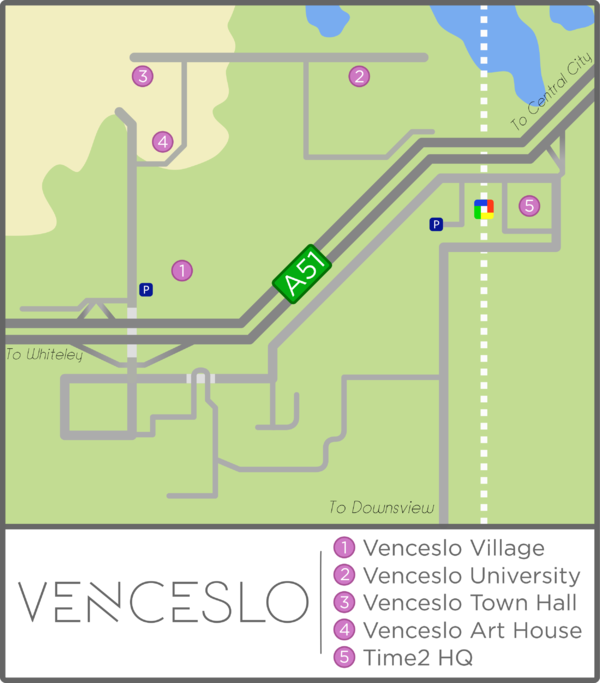 The city of Venceslo prides itself upon its diverse and unique road network, as well as its in-depth signage network. 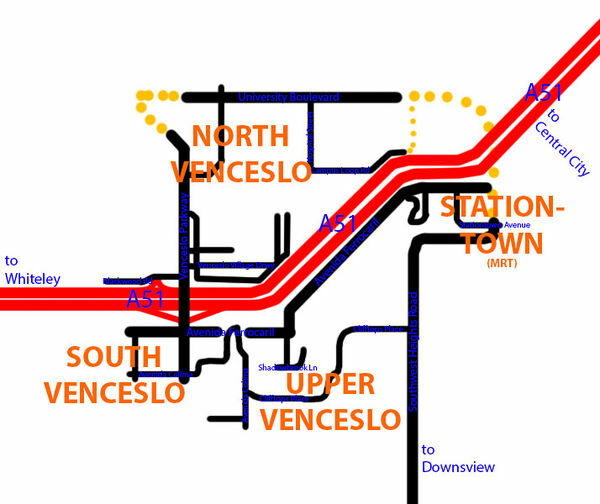 However, as an alternative for ground transportation, there is the VMet , Venceslo's local subway system. The city is also serviced by the B & K lines of the STC. Venceslo is also serviced by ZS20 Venceslo Station, and the town is in possession of ZS19 Foobar, but has not done anything with it yet. Venceslo-Fifth Ward Airport is Venceslo's main airport. It has a large mount of airlines and destinations that serve the New World as well as two flights to the Old World. It is serviced by VFW Driveway (which can be accessed by A51 exits 7a or 7b). 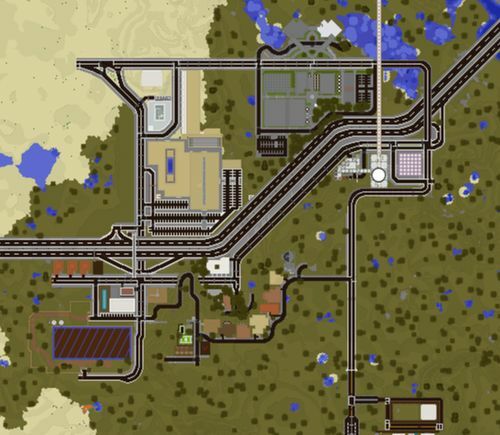 It has a direct connection with both the VMet and the STC, named Airport Station. The easiest way to get to Venceslo without doing /tpa time2makemymove is to go to the Central City Warp Hub, take the warp to Circle Line South ( C61 Foobar- ZS18 Foobar), and then go on the Zephyr Line outbound two stations to ZS20 Venceslo Station. Two third party rail lines service Venceslo, both of them stopping at Venceslo Midtown Station: BluRail's  line, and Fred Rail's PS&L line. There are three road exits in Venceslo from the . The also runs straight through North Venceslo, named University Boulevard, Venceslo Parkway, or Crenshaw Highway, depending on the region. The city of Venceslo from above on February 6th, 2019. The entire northwest corner of Venceslo (near and including the stadium and Venceslo Village) was rebuilt, as well as some further expansion efforts on the Upper Venceslo east side and a new concourse and new runway for VFW. Other small additions were added around as well. Old photo taken on September 2, 2018. There was large expansion efforts in the northwest area (RiverWalk Shops, QuartzBank Tower, etc), and the southeast (lots of houses) - as well as some reorganization in the southwest (moving the farm and building BLOCKLAND VENCESLO. Old photo taken on April 29, 2018, it’s first documentation since achieving Governor. Many new changes can be seen. Obvious ones include the demolishing of UAV, construction of VFW, construction of Venceslo Gardens and expansion of eastern Upper Venceslo, FliHigh Center, and some new VMet stations. However, there was also a B-road (B54) constructed in the meantime, and a couple A51 interchanges were redesigned as well. Old photo taken on December 27, 2017. The changes are a bit less obvious: additions include a multitude of new houses in Upper Venceslo, as well as Venceslo City High School (VCHS) up there as well; the addition of Sonny Dorm Hall in Venceslo University; and the addition of new houses on Avenida Ferrocaril in South Venceslo - not to mention the Arch of Venceslo, also located in South Venceslo. 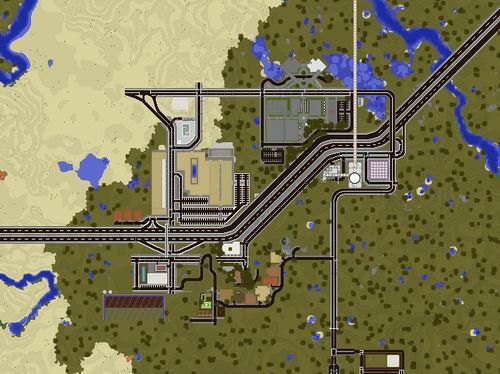 Oh, yeah - there’s also a brand new Warptrain Station as well. Old photo taken on November 9, 2017. The first documentation since it recieved Senator and was consequently considered a city. UAV Airport can be clearly seen, as well as the Village expansion, the Venceslo Monorail, and Icicle Holdings Stadium. Old photo taken on September 28, 2017. The changes from the VMRP can be clearly seen, especially the movement of the Convention Center from west of Venceslo Parkway to east of Morton Hill Road. Old photo taken on September 14, 2017. This is the last ever documentation of Venceslo before the VMRP was enacted and many buildings were moved around. Old photo taken on August 21, 2017. Old photo taken on July 31, 2017. Map of Venceslo as of August 23, 2017 with CartoGraphics. Map of Venceslo as of August 22, 2017 not with CartoGraphics.